This Christmas frame will add plenty of jolly to any holiday décor. 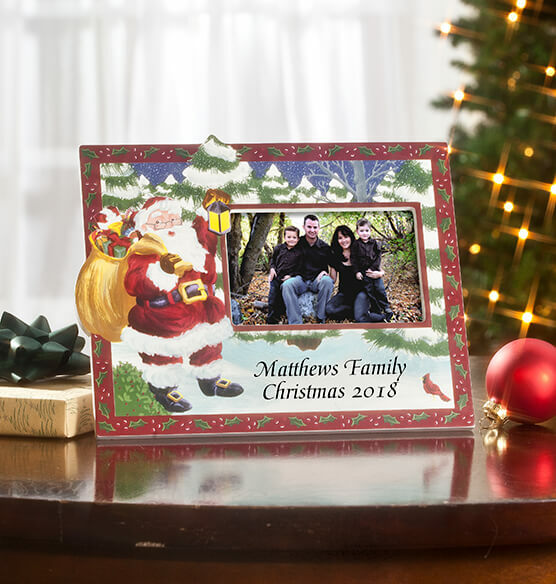 Personalized with a custom message, it makes a great addition to a seasonal frame collection or the start of a new family tradition. 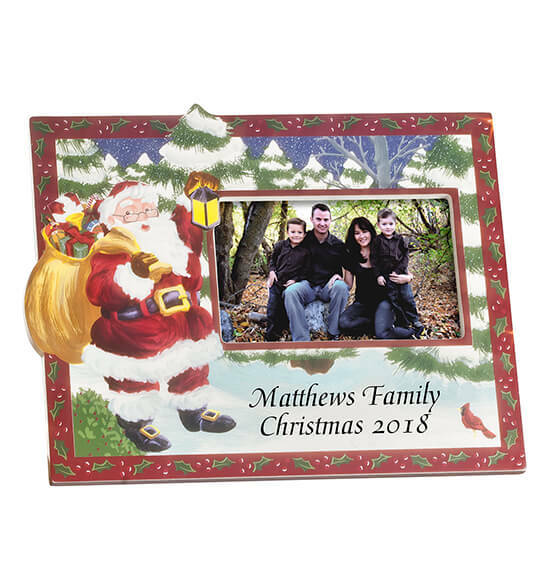 The photo frame features Santa himself, out on his Christmas Eve journey to deliver toys. Makes a perfect gift idea. I got this to give as a Christmas gift for family. I am very pleased with the quality of the frame, hand painting and speed of delivery. Thank you Miles Kimball! Been collecting these frame for quite a few years and love this years design! Very nice touch allowing us to personalized the frame this year. Looking forward to filling the frame and displaying them all again this year. I have been purchasing and displaying my frames since 1996 and I will continue to purchase them. Yes, the look of the frame has changed some, but as you can see from my picture, they all go together nicely. Honestly, no one notices that the print has changed in the last couple of years. They only notice the collection as a whole. Visitors almost always comment on what a neat idea it is to display all the pictures from over the years. I leave the pictures on the wall year-round and it's definitely a topic of conversation when others come to visit. Our own family enjoys them so much, too! Please don't stop making these frames! I have been buying and collecting these frames for over 15 years. I like the old style better. the opening does not fit a 4x6 picture. Very disappointing. Not sure I will buy next year. I have had these beautiful frames since 1995 however the picture size has remained 5"x3 1/2" while most pictures are now 4"x6". (I use this frame to put our Christmas card in) I haven't received a 3 1/2"-x5" picture/card in a very long time, nor have I printed one. I LOVE these frames but I have a fairly large family and I've literally had to cut several people out of the picture for it to fit. I just wish the picture insert was larger. Im giving this frame 3 stars only because the photo insert size is just too small. I recommend this beautiful frame BUT I'd make sure that people were made aware of the smaller picture insert. I have been buying these frames for 20 plus years and using them to display our Christmas card picture. It makes me sad that they are not the same quality. The frames now appear to be mass produced. The writing on it is stamped as opposed to hand written. In order to maintain the tradition, I keep purchasing but I am not thrilled with the product. I've been collecting these frames since 2000. I have always loved them, especially when they were hand painted. This years frame looks like complete junk. The typed font is awful. When you place this frame by the frames of years past you can see the quality has really suffered. Very, very disappointing. I've been buying these frames since 1999. I do not believe that they look handpainted anymore - even though they are advertised as such. The writing looks like a font that was just stamped on. In fact, if I saw this frame at a discount store, I would pass it by. Exposures - please go back to the way you used to make them! I must agree with the others. This frame used to be unique and charming. Now it looks commercial and there seems to be less focus on the photo and more on a large picture of Santa. Please go back to the old method of production and the hand-painted quality. I bought this because it has become a tradition, but as the newer frames sit beside the older ones, the difference is glaring. You can do better, Exposures! I've been purchasing these frames for 10 years and the quality of them has decreased significantly. What a disappointment that Exposures went with another manufactured looking frame again this year! Frames from 2015 and prior were so much prettier - I thought for sure they would switch back after the negative feedback from last year's frame. I was especially surprised to see they switched from handpainted wording on the frame to a printed font - feedback last year was that people wanted it to look more handpainted, not less? What a bummer that we will not be buying these frames anymore in the future. I will Not purchase this frame again. It is suppose to be hand painted and it is a cheap replication of years past. I have been collecting for 8years and the 2017 is Not Hand painted. Buyer beware!! I've been a lover of the Christmas frame for over 2 decades...each year I bring them out and display them all over the house. I just opened my package from Exposures and was so disappointed with this year's frame. Overall, I've been increasingly disappointed with Exposures products but was hopeful that you would maintain the high quality of the frame. You say in the description that the opening is for a 4 x 6 photo but the opening in my frame is 3 1/2 by 5. This is the first year ever that's been the case. What gives? I hope you return to your previous designer for 2018. If I could give this 0 stars, I would!. I'm so disappointed with the quality of this frame and the size of the photo opening. I've been buying these frames since 1997 and displaying this collection is one of my favorite parts of Christmas decorating. Please go back to the original frames. And a few year ago, you offered a frame in the collection that could be personalized with whatever year we chose, please offer that again so I can make up for 2017. I agree with the other review. I do not care for the new look. Have been buying these since 2003 and this may be my last year. I do not like this frame but my family is making me continue one more year. Hopefullly, you will change it to a better frame next year. Can't purchase after 20 years! I have been collecting these frames since 1997. I agree with all the other comments. The quality has gone down dramatically. I just can't justify the price plus shipping. I am so sad to see this tradition leave our home. Let me know if you get a new vendor. Very disappointed in the frame quality this year. After buying for years they are no longer hand painted or well made. Will be looking elsewhere for our yearly frame. I have collected your "hand-painted" Christmas frame for 14 years now. The quality of this year's frame is poor. It does NOT look hand painted, especially the stamped on Christmas 2017!! I was truly disappointed this year. Please go back to wat you were making them! The year I FINALLY stop buying these frames! Only giving this 1 star because I had to...I have been buying these frames since 1995 when my oldest was born. I love displaying my boys' Christmas card picture in them. Over the years they have slowly lost their hand painted appeal, but I kept purchasing them because I did not want to miss a year in my collection. My older frames are beautiful and my more recent are cheaper looking. This year's frame looks like something you would pick up at the dollar store! Good bye Exposures! I too have been ordering these frames for 20 yrs. Due to the disappointment of fellow collectors, I'm skipping my annual purchase. Please return to the quality holiday frames we've loved collecting and displaying! I love the way the frames look from year to year. I have them all lined up together. I have had one of these frames for about almost 20 years. Wanted to be able to personalize more. I have ordered these frames every year since 2005. I love them and enjoy looking at each one every Christmas when I take them out display. Been collecting these frames for 20 years! Such a fun Christmas display that brings back wonderful memories. I purchase these every year. I have purchased these frames since 1998 and have them set up in my home with the photos of my children as they have grown up. One of my favorite holiday decorations. I've been ordering these frames for our Christmas card pictures since 1999! Almost missed this year's! I have been collecting these frames since 2002. They are so pretty and I love looking at them each year as I put out my Christmas decorations. its a tradition! I get one every year for my niece! Because I have been collecting others however it should fit a 4x6 picture and be hand painted as in 10 years ago. Much nicer than. Tradition, every year since having kids! 13 years now!! These are wonderful gifts and can become a special holiday tradition. These are the perfect holiday mementos because you can order a new one each year for your children. Highly recommended! I have ordered them every year for 15 years. I love them! We have been buying these frames since 2001. Love how they coordinate together. I have been collecting these since 1996, when my first grandchild was born--it's been fun seeing how they have grown in these 21 years. Because I bought one last year and loved it. Hope this one is as nice. We've purchased these frames for 20 years and love them. I have been buying these since 1999 and planned to continue until my kids were both 21. With the reviews I read, I am concerned about the quality. Hopefully I will still enjoy the frame. My Girlfriend has collected these frames since 2003. Her display of their family is amazing with these frames. I wanted to start my daughter a collection as she starts her new "Married" life. Each year they are different and all beautiful. I have been collecting these frames for 20 years! I buy one every year to display the family picture we use in our photo christmas card...I have been buying them since 2004! I buy this frame every year for my parents. I love these and have bought them the past 19 years. I have bought these frames every year since 2004. Sadly, this one doesn’t look as “hand painted” as those of the past. But, my Home at Christmas wouldn’t be the same without these, so my fingers are crossed that it’s ok. I buy this every year for the last 15 years it is so nice to display them and look back through the years. If we choose "No Personalization" will the frame come as they have in the past with Christmas 2017? We've been ordering these for the past 8 years and I just want to make sure they are consistent. BEST ANSWER: Thank you for your question. Yes the Christmas 2017 will be printed on the frame. We hope this information will be of help to you. Does this have to be Christmas 2018 or can it be a different year? BEST ANSWER: Thank you for your question. You can choose any year it is not set to 2018. We hope this information will be of help to you. I am pretty sure you can customize it to say whatever you would like. Frames from earlier years are available on line. No, I need it to be Christmas 2018. Thank you. BEST ANSWER: I bought the 2017 frame and it is beautiful and goes very well with my collection. The only thing that is different is the script which does not look 'hand painted'. It looks more stamped or printed somehow. Also, the cut out for the picture looks a little smaller. I am still happy with the frame and have it hanging with my whole collection since 1996 and it fits in very well. The 2016 frame is slightly larger than the others, but the 2017 seems to be the same size as all the others. They are basically the same size as the ones from previous years. I didn’t notice a huge difference in the Christmas frame like I did in the Halloween frame. They are different. I have been buying them every year since 1995 and the recent ones are not as special. That’s too bad. Do they look well with your collection? Can I buy 2009 hand painted picture frame? BEST ANSWER: Thank you for your question. We do not have back issues of the frames. You can personalized this one with 2009 though. We hope this information will be of help to you. This says it’s opening is for a 4 x 6 photo but i just received my frame and the opening is 3 1/2 by 5. What’s up? BEST ANSWER: Thank you for your question. This holds a 4 x 6 photo. We suggest you call our Customer Service department at 1-800-572-5750 for further assistance. We hope this information will be of help to you. is this a 5x7 or 4x6 frame? BEST ANSWER: Thank you for your question. This is a 4x6 frame. We hope this information will be of help to you.